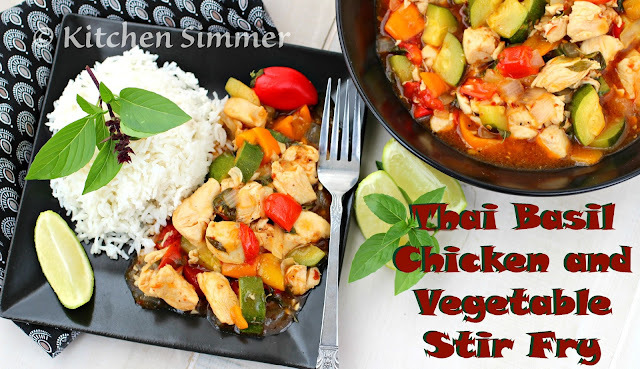 My summer vegetable garden is almost gone, but before I said good bye to it I used up the last of my peppers, tomatoes, zucchini and Thai basil in this spicy and delicious Thai Basil Chicken and Vegetable Stir Fry. Thai basil is one of my all time favorite herbs. I actually love it better than regular basil that is used in Italian cooking. 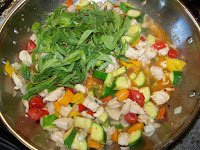 I love how the Asian flavors of fish sauce, soy sauce and garlic play off the Thai basil. 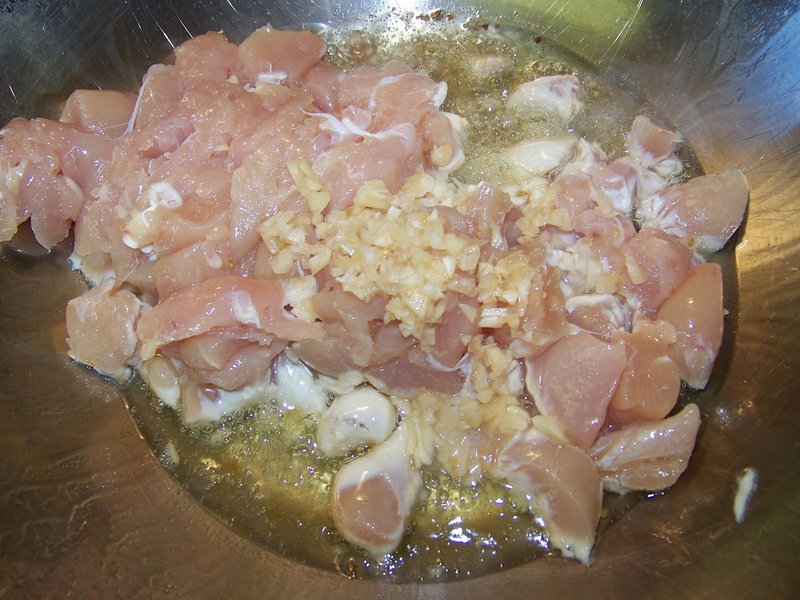 This combination of flavors works well with any type of meat (beef, chicken, pork). So, it's really a flexible dish to what you have in your fridge or freezer to cook. You can even substitute seafood in this dish and it's superb! 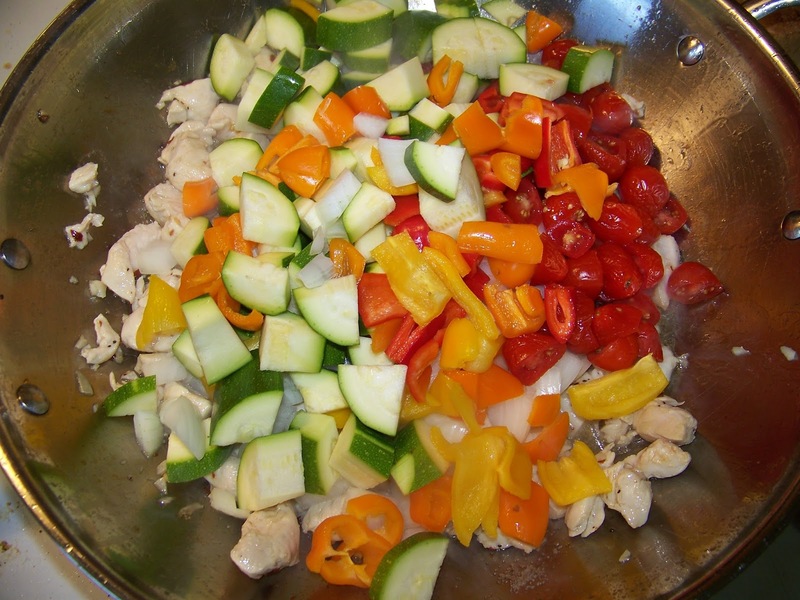 We ate this over plain white rice, but I could eat it over pasta or even quinoa for a more protein packed meal. If you are planning on growing herbs this winter, or are lucky enough to live in a climate where you can grow herbs outside all year long..try Thai Basil. You will love it. Heat 2-3 Tbs canola oil in large pan or wok on high heat. 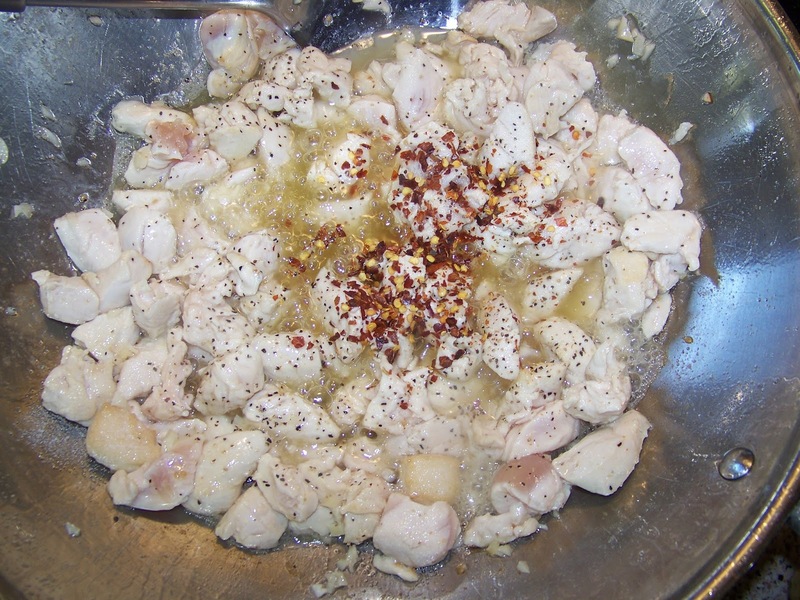 Once heated add the chicken, garlic and red chili flakes and stir fry for 2-3 minutes. 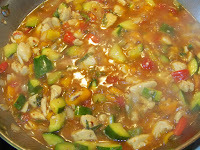 Next add the chopped vegetables and cook for several minutes with the chicken. The juices from the tomatoes and zucchini will start to render into the pan. Then increase the heat back up to high and add the cornstarch/water slurry to thicken the sauce. Taste for seasoning and adjust as needed with more fish sauce for salt. Serve with rice. Enjoy. This sounds like my kind of weeknight meal! I love all of the bright, healthy vegetables. Love these flavors! 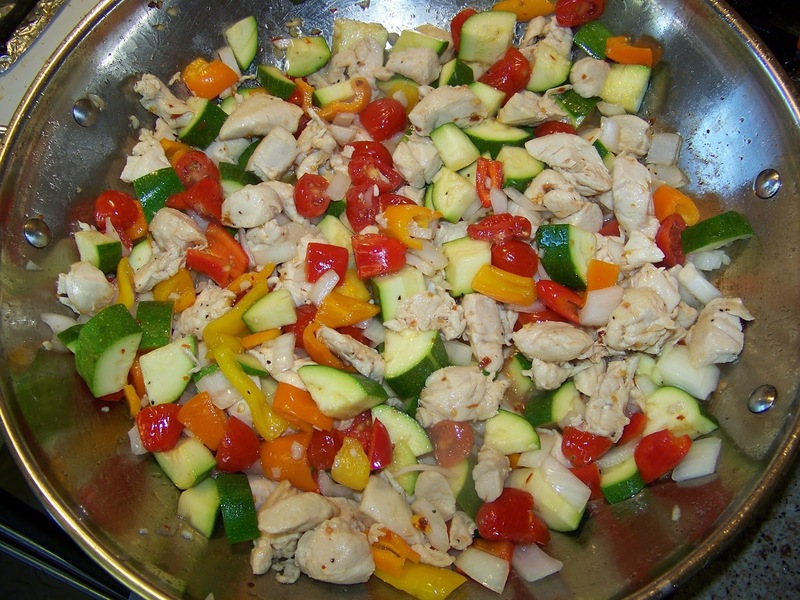 This stir fry looks so good! YUM! Ramona this is not only gorgeous to look at but sounds so aromatic and flavorful! 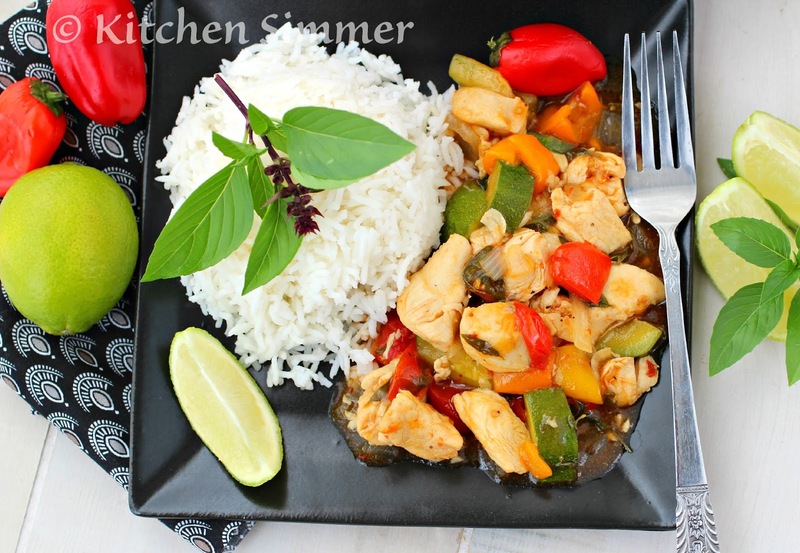 I don't think I've actually cooked with Thai basil...this dish makes me want to try it! I've never cooked with Thai basil before, but I love basil, and we do grow it so I think we will add it to the mix next year! And your recipe looks delicious! I absolutely love Thai food! 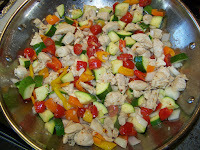 Beautiful dish, love using fresh veggies. Haven't tried Thai basil yet, now I know what to do with it! YUM! Thai food is always so scrumptious. Yummy! This sounds so good, Ramona! Thai basil's amazing! 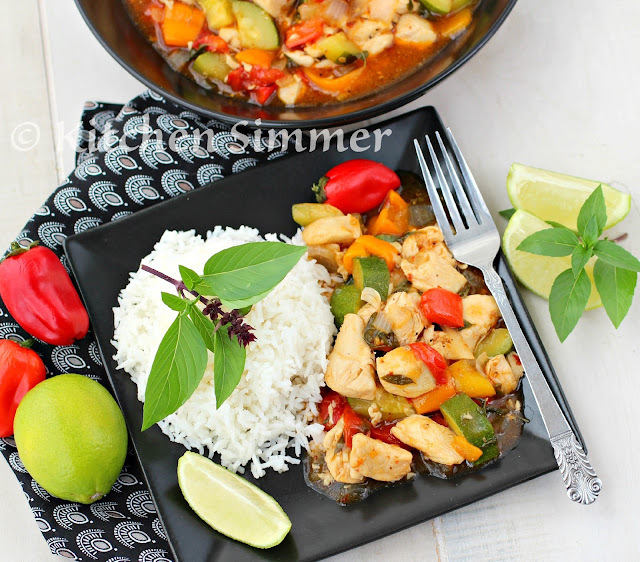 Are you having a Thai week? I'm coming over! Love Thai food. This looks amazing! I have been hoping to try Thai basil for a while now :) thanks for sharing! That's a very interesting recipe! I know its warm out and I should want comfort food, but this looks so refreshing and it completely fits within my healthy eating requirement! Im definitely going to make it soon!! Yum! What a great combination of colors and flavors! 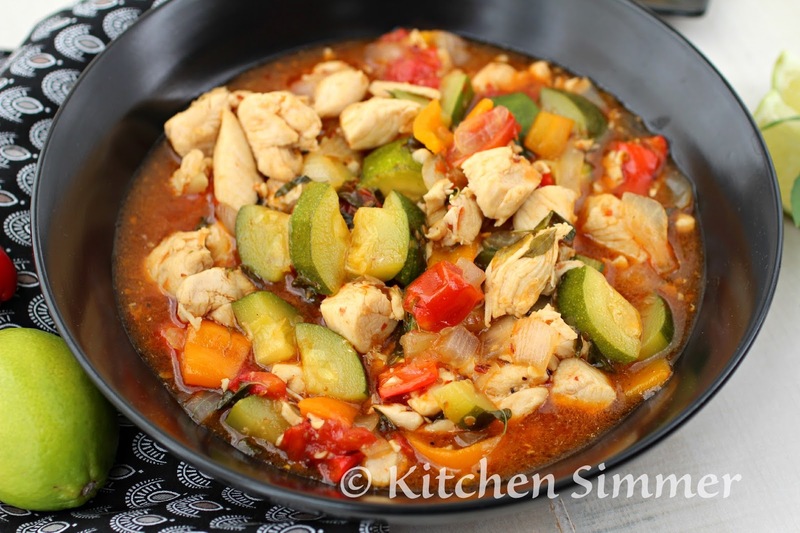 I'm always looking for easy and delicious meals so I don't have to order takeout when schedules are crazy. Definitely saving this recipe! This looks so bright, colorful and yummy too. Love it. I love this recipe. Fresh, bright and delicious! I'm always looking for a way to sneak veggies into each dish and this stir fry looks delicious! Sounds scrumptious! 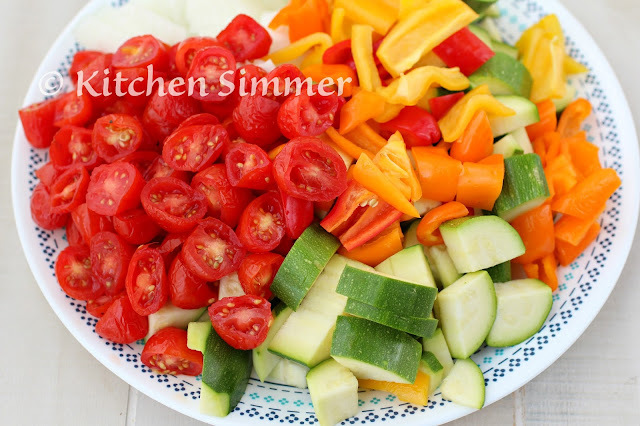 I love how many veggies are packed into this dish! I love thai food Ramona! and LOVE Thai Basil too!! I've already eaten, and I'm getting hungry again! 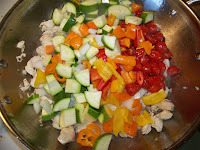 :D Love how colourful and flavourful this stir fry is!